Isabella Matilda Davis Brittingham was a significant early American Bahá'í and was posthumously designated by Shoghi Effendi as one of the 19 Disciples of 'Abdu'l-Bahá and Heralds of the Covenant. She was born in 1852, the daughter of Benjamin Davis, who was a grandson of John Morton, a signer of the Declaration of Independence. Her sister-in-law heard about the Bahá'í Faith in 1897 and in 1898 Isabella herself became a part of the nascent American Bahá'í community. In September 1901, Isabella went on pilgrimage to the Holy Land, where she met 'Abdu'l-Bahá, the leader of the Bahá'í Faith and son of the Founder, Bahá'u'lláh. She used the knowledge she gained there to write "The Revelation of Baha-ullah in a Sequence of Four Lessons", which was published by the Bahai Publishing Society of Chicago in 1902. There were nine editions of this work, the last being in 1920. It was one of the earliest accurate accounts of the Bahá'í Faith published in the West. 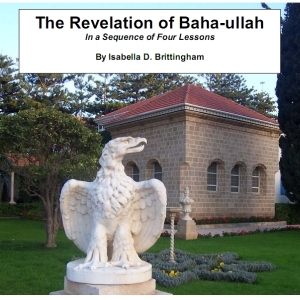 The main purpose of the book is to demonstrate the truth of Bahá'u'lláh's Revelation through Biblical prophecy.